Ever wondered what the basics of “Reformed theology” are? Or do you want a good refresher? 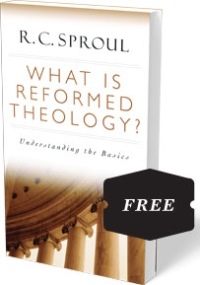 Here’s a great way to learn more by requesting a free PRINT copy of this book in the mail from Ligonier Ministries and renowned theologian and pastor R. C. Sproul (includes free shipping). Offer only valid for domestic U.S. addresses. Few evangelical Christians today understand Reformed theology, even though it has become an immensely influential theological tradition. Recognizing only key terms relating to predestination or the five points, many Christians want a better explanation of the concepts and beliefs that make up a Reformed perspective. What is Reformed Theology? is an introduction to a doctrine that has eluded so many evangelical Christians. And who better to teach about Reformed theology than R. C. Sproul? In thoroughly expounding the foundational doctrines and five points, Sproul asserts the reality of God’s amazing grace. For anyone wanting to know more about Reformed theology, this candid book offers a coherent and complete introduction to an established belief. This sounds great but it doesn’t say that it is only good for people new to the ministry. ..at least I did not see this on the blurb. Just wanted folks to know. Yes, you are very right. This resource is great for Christians of any age and maturity! Bianca means that the offer is only good for people new to Ligonier. Click on the link under the resource photo that says, “Go here to Request this FREE Book,” and you can sign up for it to be delivered to you. Free shipping still available for a limited time!